Tanmit 100 Coloring Gel Pens Set!! Sweet Deal!! 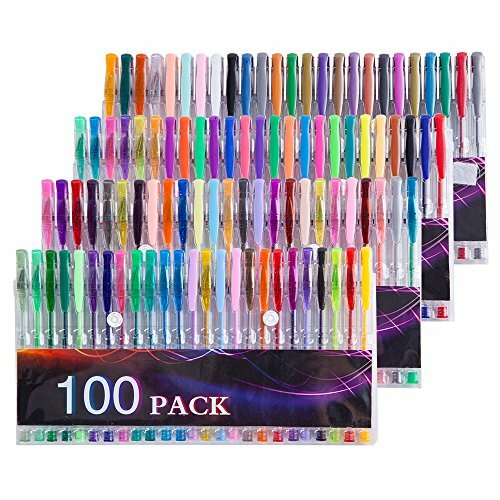 Colored Gel Pens: 100 Unique Colors Ink Pens in a Variety of Styles including Red, Blue, Yellow, Orange, Green, Purple, White, Black, Gold, Silver, Chrome, and many more! For Adults, Kids Coloring Books, Sketching, Drawing, Painting, Writing, secret garden. We Promise superior ink and hard Tip (tip size 0.8mm) which are More Thin than Markers,that makes the pen writing smoothly and using durable! Packaged in Case: Compact colorful Storage - Foldable design makes it easy to store in a backpack, drawer, locker, or shelf! Gift Idea for Halloween,Christmas and any festival: Get it and Enjoy it! Money Back Guarantee from the Manufacturer - If any are inoperable, damaged, or if they're not up to your satisfaction the Manufacturer will offer a Free Replacement or a Full Refund. This is the best product to match the most popular Adult Coloring Book!